Retreat House (left) is connected to the Sanctuary via outdoor walkways on both levels. The Retreat House has 15 rooms — 2 floors with 7 single occupancy rooms on each floor. Each room has a sink and mirror, a glider rocking chair, a desk with chair and a twin bed. On each floor there are 2 private toilet rooms and 2 private shower rooms. The upper floor has 1 queen room with private bathroom. Towels, linens and soaps are provided for each room. There is a large common room with comfortable seating on the ground floor. 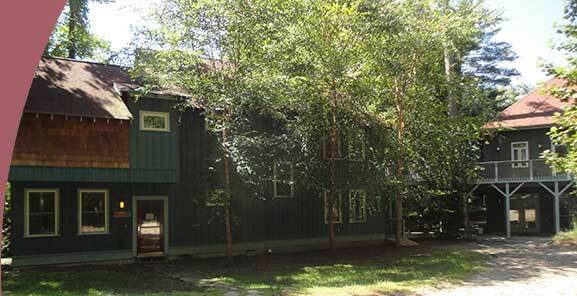 The retreat house and Sanctuary have high speed wireless internet access. Site design by Michael Hosford. Site and contents © 2005 Sanctuary in the Pines. All rights reserved. This page has been viewed 16115 times.